It’s estimated that as many as 1 in 3 properties in Australia are affected in some way by termites. It’s also estimated that at least 50% of homes with active infestations, could have been better protected through the implementation of precautionary measures, such as barriers baits and traps. Unfortunately however, this is not always the case. Termite infestations, especially those left undetected, can cause significant amounts of structural damage which often results in costly repair bills. This is why, its absolutely vital that property owners take every means possible to protect their homes and businesses from being affected. What is a termite chemical barrier? 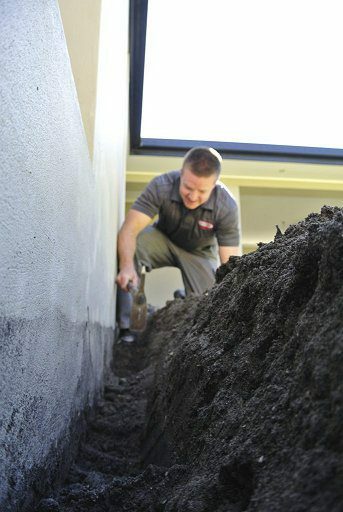 A termite chemical barrier is a chemically treated zone that surrounds the perimeter of a building or structure. This treated zone lays beneath the ground, positioned strategically in an effort to disrupt the termites natural path. The chemicals used to create this barrier prevent the termites from breaching the treated area, and gaining access to your property. Termites that come into direct contact with the treatment are killed off, and also, over time the entire colony is killed off as the effects of the treatment are passed between the termites themselves. This is what makes this treatment method particularly effective. How do termite chemical barriers work? 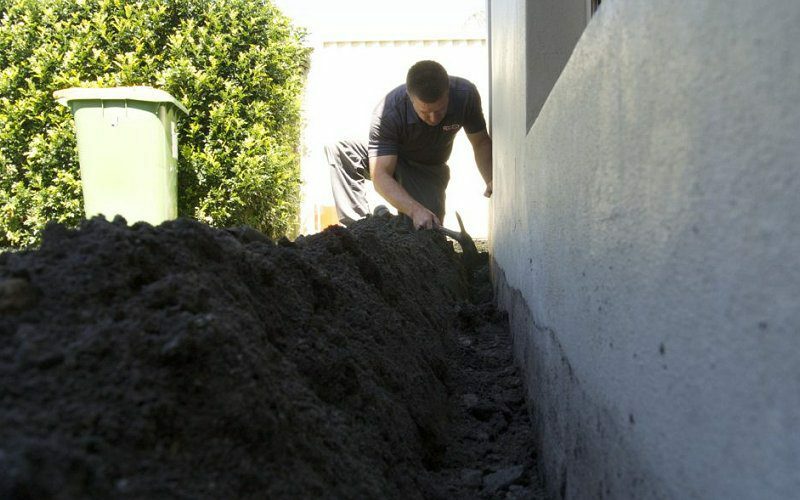 It’s absolutely vital that before a chemical termite barrier is installed, that a thorough termite inspection of the property is carried out. This is done to ensure that there aren’t any active termites inside. Obviously, if live termites are found within the property, they need to be treated before the barrier can be installed. If live termites are discovered, we perform immediate treatment and return for a follow up inspection 21 days after, to ensure successful removal before installing the chemical barrier. Of course, if no termites are present, installation of the barrier can commence immediately. The actual barrier is then installed via way of digging a trench around the perimeter of the building, approximately 300mm wide and deep enough to expose the footings of the building. This trench is then injected with a termiticide chemical compound mixed with water that binds with the soil. As termites forage through the soil looking for sources of food, they come into contact with the barrier, which delivers a lethal dose of the chemical to the termites. 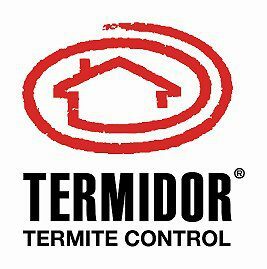 The industry leading product is termidor and is the only product that has what’s referred to as a “transfer effect” meaning the barrier not only prevents termites from from entering your property, but it also passes over the affect of the chemical to other termites, which then eliminates the entire colony. Termiticides unlike repellents, are far more effective, as repellents simply deter termites, without killing them off or eradicating the main nest. Pest-Ex always use termiticide products, so you’ll have total confidence in knowing your property is protected. Chemical termite barriers are a great preventative solution for homes and buildings that have been built without a physical barrier in place. They provide protection without having to make any costly structural alterations. It should be noted that due to changes in building standards, that almost all new homes are now built with physical termite barriers in place. These are specially treated plastic or metal mesh type sheeting that is placed underneath or around the edges of the concrete slab (or on top of foundations), during construction of the building. They are a great long term preventative measure as they have a life expectancy of up to 50 years. However, for a lot of homes built prior to changes in the building code, a chemical termite barrier is an ideal solution. Chemical barriers allow your property to be protected for up to 8 years at a time, without compromising the structural integrity of the building. In comparison, whilst physical barriers stop the termites from entering the property, if they’re not used in conjunction with a termiticide such as Termidor, they don’t have the added benefit of affecting the nest with the transfer of lethal chemicals to other the termites. Both when used in conjunction offer the most effective protection against termites. How long do chemical barriers last? Pest-Ex use only high quality Termidor chemical barriers which last 8 years. These barriers all come with a $2 million dollar assurance warranty from BASF Termidor. All of our installations are carried out in strict accordance with Australian standards, and as Termidor trained professionals, we are able to pass that assurance onto our customers. All chemical barriers installed by us are certified. Upon completion of the install, this certification is acknowledged by BASF, and the customer receives the warranty certificate. It should be noted that this certificate of warranty is subject to 12 monthly inspections. This is simply to ensure that your barrier is maintained to a high standard, and also to ensure that we detect any potential disruptions to the barrier ahead of time before any termite damage occurs. The active chemical used in termite barriers is similar to those used in many common pet flea treatments, so once in place it poses no immediate threats to children or pets. It’s also a liquid based solution, which is injected into the soil, as opposed to an airborne chemical used for a large number of traditional type treatments. This means there is no risk of exposure for anyone accessing the area. As a precaution however, we do recommend for pets to be kept inside whilst the barrier is put in place. The liquid barrier then usually takes around 3 hours to dry, after which you can rest assured in knowing that your children and pets can play safely in the yard. Prices for termite chemical barriers vary depending upon the size of the property being treated. Cost is calculated per lineal meter, so larger properties obviuously cost more. For an average sized 3 bedroom home on a typical sized block, prices start from $2,300. This of course comes with a guarantee, includes yearly inspections and will protect your property for 8 years. This may seem like an expensive option, but if you factor in the cost over an 8 year period, you’ll realise it’s much more economical than having to deal with facing costly repair bills. It’s always best to have one of our pest controllers inspect your property in order to provide an accurate quote, but more importantly to ensure that a chemical barrier is the right option for you. Similar to cost, the time that it can take for installation may vary depending on the size of your property and the area that needs to be protected. Typically, we assign multiple technicians onsite to minimise installation times. To put an average sized barrier in place for a regular sized 3 bedroom home – with two technicians at work, an installation can usually be completed within 7-8 hours. This means we can have your home protected from the threat of termites within a days work. Ready to work with Pest-Ex? If you would like more information on our chemical termite barriers, or to discuss the best options for protecting your property against a costly termite infestation, please give us a call to schedule an appointment. 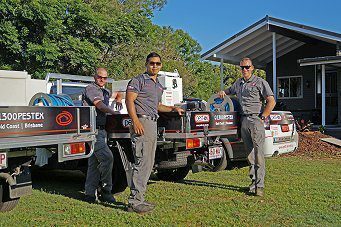 We’ll organise to have one our pest control technicians inspect your property and provide you with a free quote, and to ensure that a chemical termite barrier is the right choice for you. If not, we’ll be able to provide another option that best suits your needs. So give us a call today, we look forward to helping you.